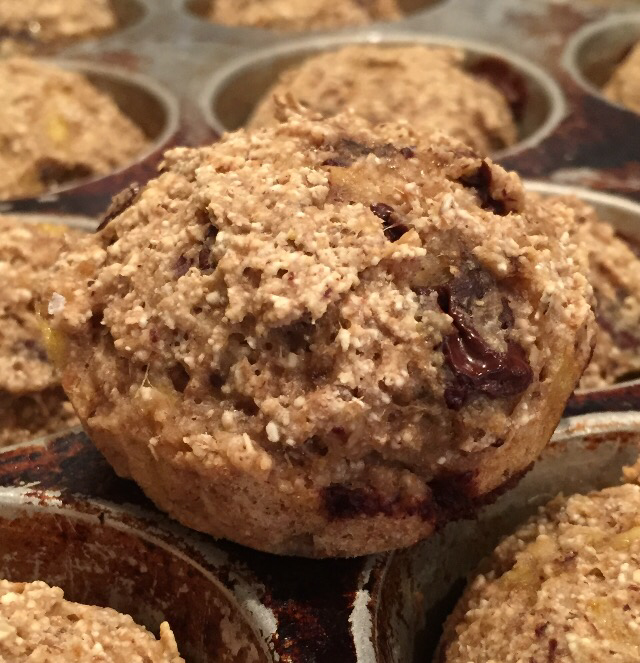 Banana Chocolate Chip Muffins – Another great muffin recipe that can serve as breakfast on the go or as a lunchbox treat. 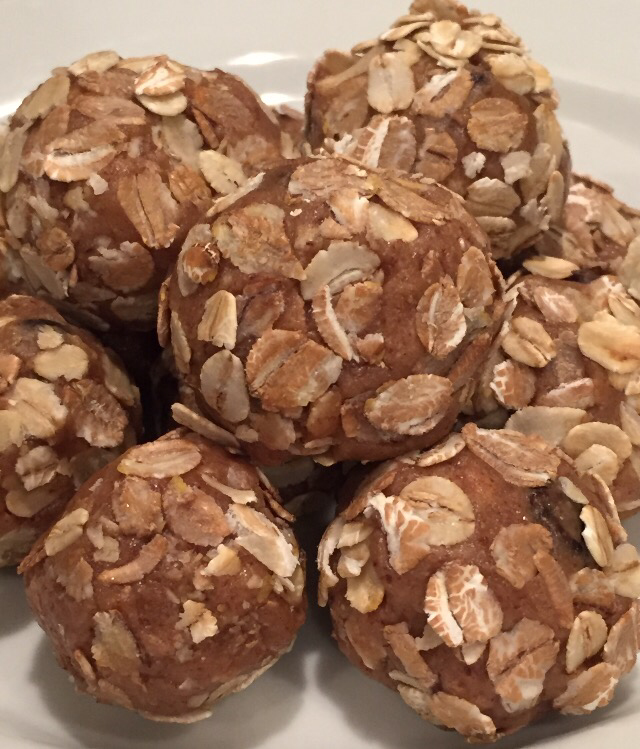 Oatmeal Raisin Nut Butter Bites – These are not new to We Eat For Real – we just love them. Since they can get a little soft, I sometimes freeze them if they are going to be in a lunchbox. Per Per my little one, they are “perfect” by lunchtime. Sweet Corn with Beets and Basil and Grilled Chicken Sausage – This is an impressive and side dish that doesn’t take a lot of effort other than to boil the corn and beets. After that, it’s a matter of chopping up some basil and stirring in the cheese. 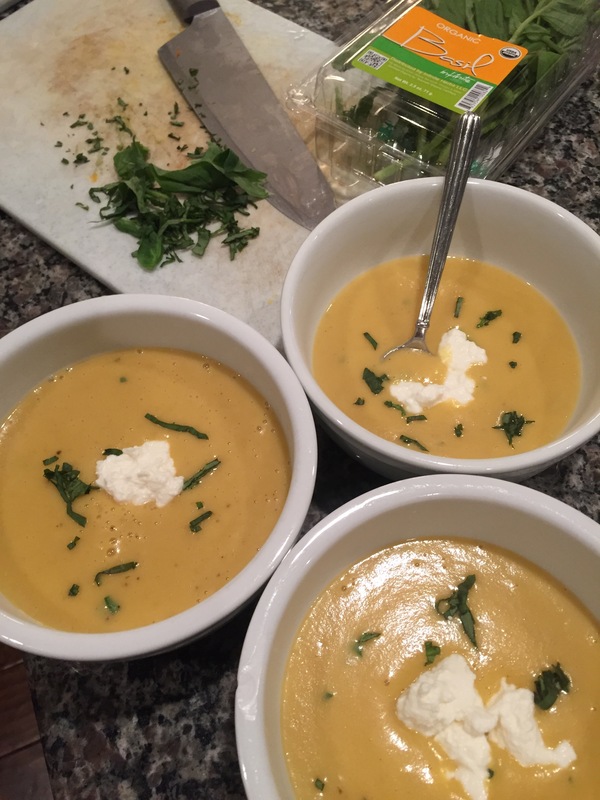 Warm Butternut Squash Quinoa – Humph…I “over roasted” (a.k.a. burned) the veggies. I programmed my oven and headed out the door for my little one’s horseback riding lesson. When I returned, my veggies were blackened. Unfortunately, this is not a Cajun recipe 😦 This was a sad, sad moment in time as this dish really showcases natural sweetness that emerges when veggies are roasted. Do as I say, not as I do and keep a closer eye on roasting veggies! 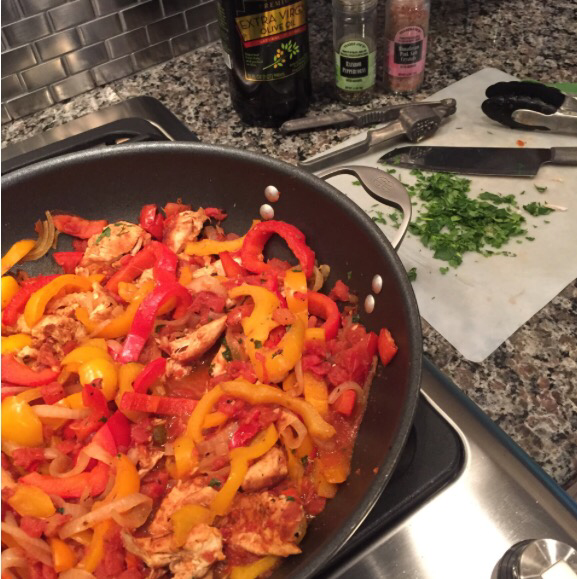 One Skillet Chicken Fajitas – Nothing new to see here. 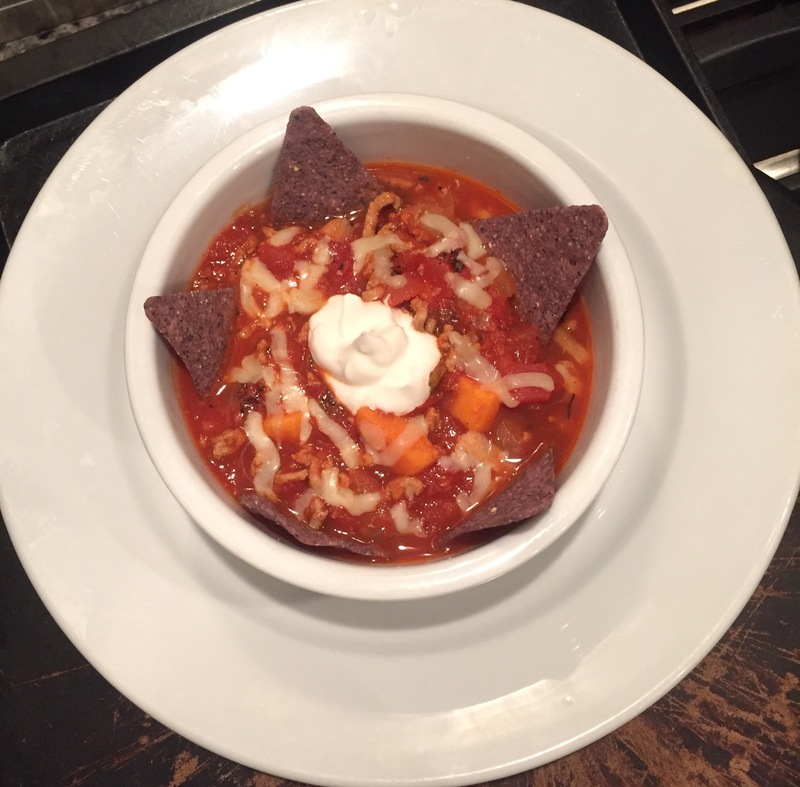 Just a tried and true recipe that makes the weekly menu list more often than not. Who doesn’t love a one skillet meal that allows everyone to create their own favorite fajita? 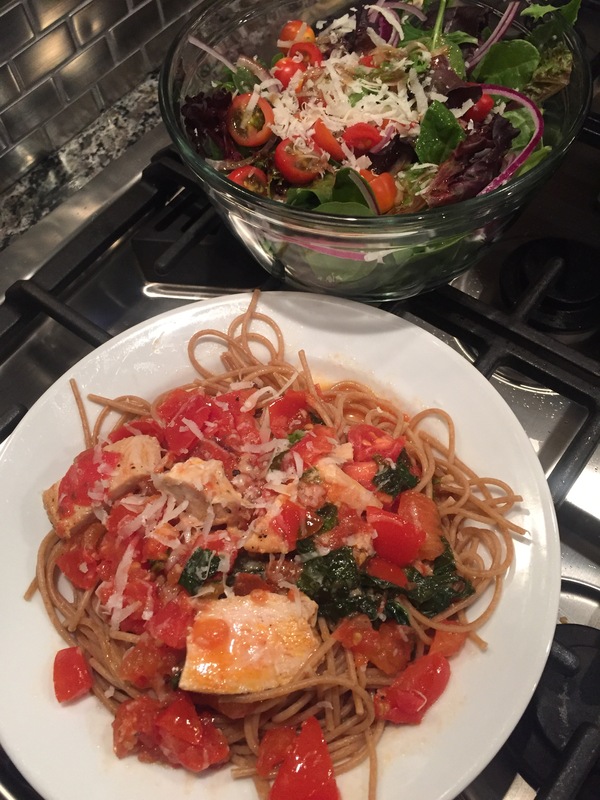 Tomato Basil Chicken Pasta with Our Take on Smashing Tomato’s House Salad – I feel as Italian as a Kentucky chick can when I make this meal. 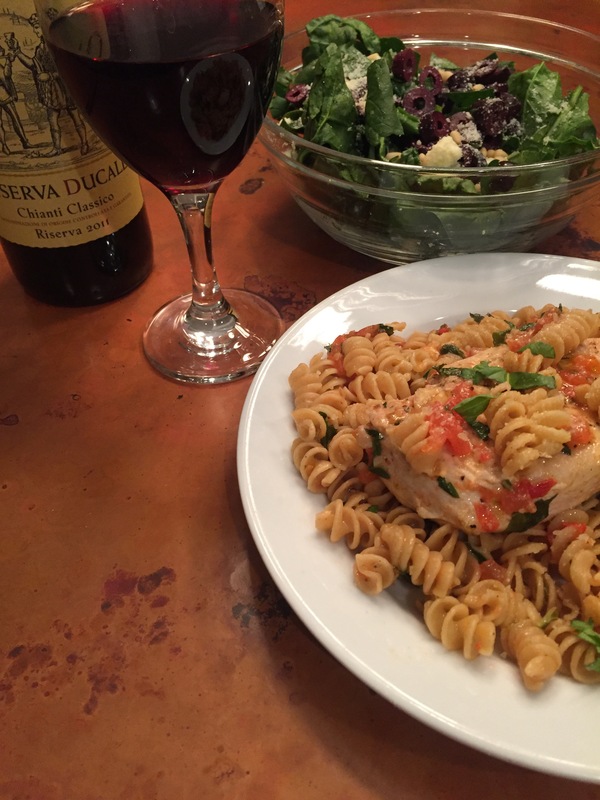 If you use fresh, good quality ingredients, this dish is molto buono! Don’t feel like chicken? Leave it out. It will still be fantastic and ready about 10 minutes sooner. That’s saying something because it’s a 25 minute meal! 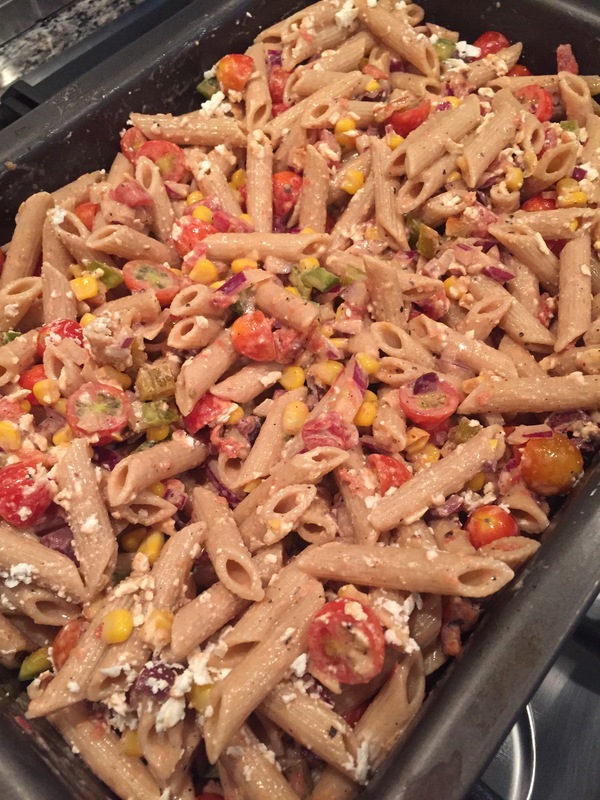 Game Day Mexican Pasta Salad – Mexican pasta?? Is that authentic Mexican food? Doubtful! However, it worked out great for tailgating. I never take a mayo based dish for tailgating (makes me nervous). Due to this, I had to rework the original recipe a bit. I used goat cheese in place of mayo, but I think Greek yogurt could work too. Next go round, I’ll change the pasta to increase visual appeal – maybe a multi-colored spiral of sorts. Smartphone users, scroll to the bottom of the page to sign up for once weekly meal plans emails from We Eat For Real. Directions: In a small bowl, mix together the wet ingredients. Add the dry ingredients to the wet. Mix together with a rubber spatula or your hands. Add in the raisins. If the mixture seems to wet, add a bit more coconut flour. If too dry, add a bit of water. Using a tablespoon to measure, roll the dough into bit sized balls with your hands. Refrigerate for 30 minutes before serving. Sometimes, I freeze these for about 10 minutes to speed things up a bit. Store in refrigerator (or freezer). Directions: Preheat oven to 350 degrees. Lightly spray/grease a muffin tin. In small bowl, combine the dry ingredients (flour, baking powder, salt). In a larger bowl, mash the bananas. Stir in the remaining wet ingredients (applesauce, maple syrup, milk, & vanilla). Add the dry ingredients to the wet and stir just until combined. Gently fold in the chocolate chunks. 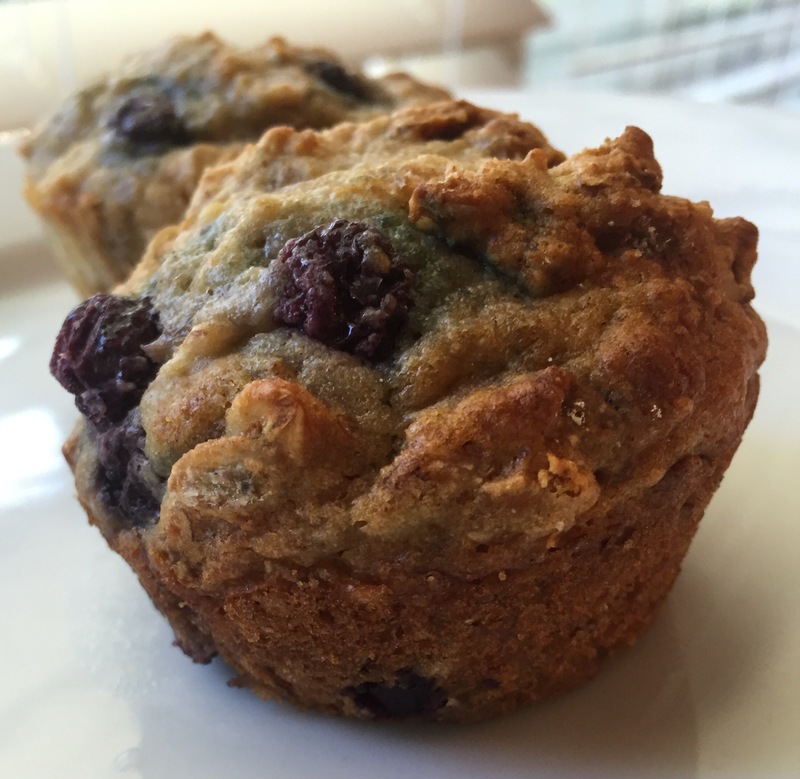 Fill muffin tins ¾ full and bake 10-12 minutes. Directions: In a large pot of salted water, boil the corn until cooked (about 4-5 minutes). Remove corn and set aside, retaining the water. Add the beets to water and simmer until soft (about 30 minutes). Remove the beets and allow them to cool slightly. Before peelings the beets, protect your hands with “sandwich bag gloves.” Once the skins are removed, dice the beets and place them in a bowl. 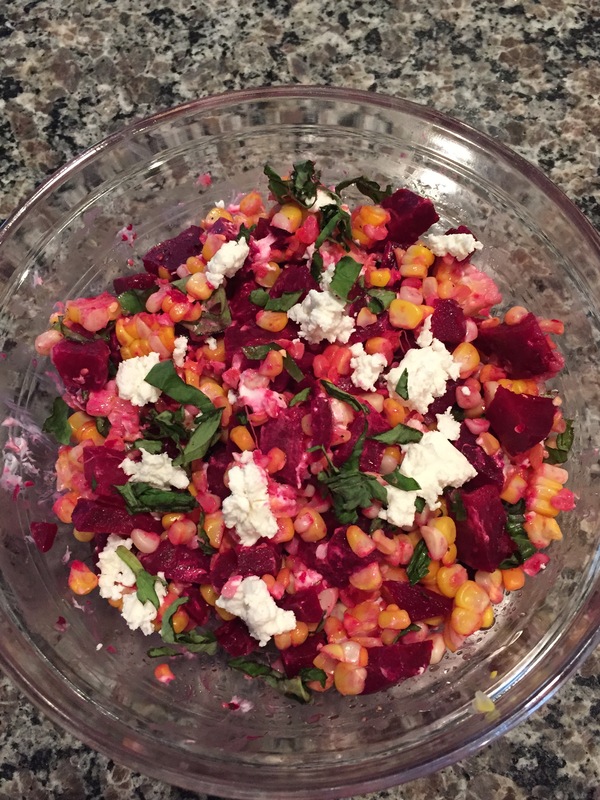 Cut the kernels from the cobs, add them to the beets. Gently mix to combine. Top the salad with fresh basil and goat cheese crumbles. Drizzle with olive oil. Season with salt and pepper to taste. Tip: Do not over stir the salad or all will become pink. Serve with grilled preservative free chicken sausage. Directions: Preheat oven to 400 degrees. Line a baking sheet with parchment paper. In a large bowl, toss the squash, apples, Brussels sprouts and onions with the olive oil, cardamom, and salt/pepper. In a single layer, add vegetable to the baking sheet – do not overlap. Roast for 45-50 minutes, flipping halfway through roasting. While the vegetables are roasting, prepare the quinoa per the package directions (replace the water with vegetable stock). Remove the quinoa from the heat and keep covered until veggies are done roasting. 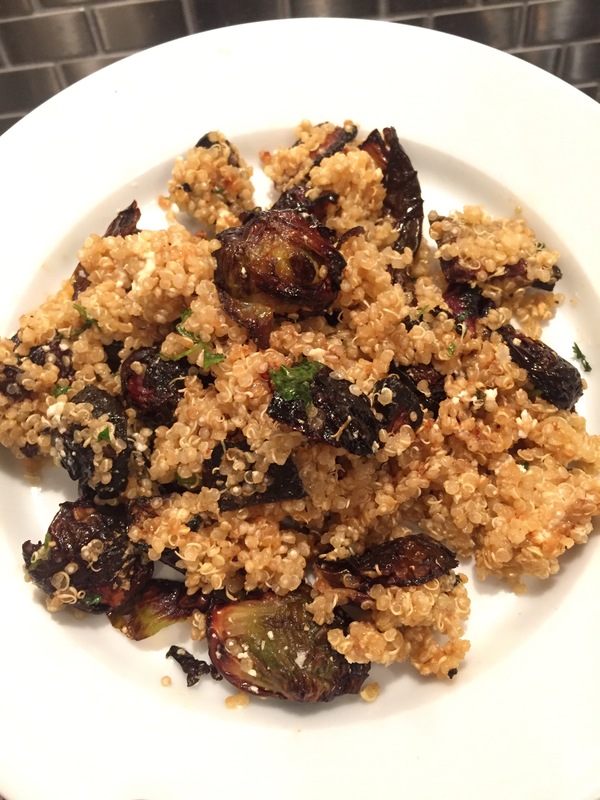 In a large bowl, add the roasted vegetables and quinoa. Stir in the feta and chopped parsley. Season with sea salt/pepper to taste. Finish with a drizzle of olive oil. Serve immediately. Directions: Cook quinoa according to package directions, substituting the water with vegetable stock. 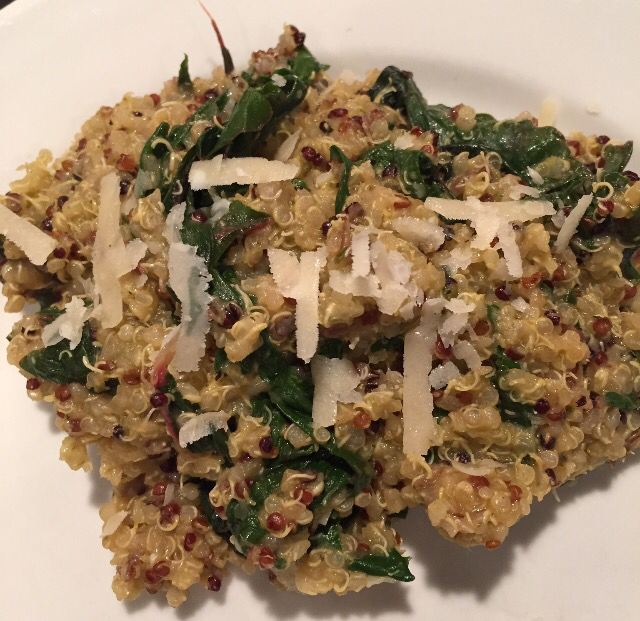 Once the quinoa is cooked, stir in the remaining ingredients: swiss chard, pesto, sea salt, and Parmesan cheese. Plate and top with a drizzle of olive oil and a bit more Parmesan cheese. Enjoy! Directions: Gently toss all salad ingredients and top with the Garlic Vinaigrette. Directions: Warm a deep, large skillet to medium-high heat. Add the olive oil. Don’t be shy. The olive oil will be the base for the sauce. Season both sides of the chicken with sea salt & freshly ground pepper. Add the chicken to the olive oil and saute for 6 minutes on one side. In the meantime, cook the pasta in salted water. If you time this right, both the sauce and pasta will be ready at about the same time. When the pasta is done, drain it. Do not rinse!! Flip the chicken, and allow to to cook another 4 minutes before stirring in the tomatoes. Things will get a bit explosive with sizzling and bubbling at the edges. Two minutes later, add the basil and then the garlic. Finally, stir in the butter. This butter is not really optional. I’ve omitted it once. It just wasn’t not the same! It’s only 1 tablespoon, and it’s organic- relax 😉. Reduce the heat and allow the sauce to simmer. Remove the chicken to a cutting board and allow to rest for 2 minutes (not a minutes less). Cut the chicken into slices on the bias before returning it to the skillet. Season the sauce with sea salt/pepper to taste. Plate the pasta and sauce. Top with a drizzle of good quality olive oil and Parmesan cheese! Directions: In a small sauce pan, add the balsamic vinegar and stevia. Bring to a boil and immediately reduce to a simmer until it has reduced by one-half (about 30 minutes). Stir occasionally. It’s ready when it’s thick enough to coat the back of a wooden spoon. Directions: Cook the pasta in salted water. During the last two minutes of cooking, add the corn to the boiling water. When the pasta is al dente, drain the corn and pasta. Do not rinse! In a large bowl, stir together the cherry tomatoes, beans, onion, and bell pepper. In a small serving bowl, whisk together the goat cheese, salsa, olive oil, sea salt, black pepper, and garlic. Pour the dressing over the veggies and stir. Once the pasta and corn are cool, gently stir them into the mixture. Refrigerate until ready to serve.